Public Safety Minister Ralph Goodale said Justin Trudeau’s Liberal government wouldn’t be “deterred” in deciding whether to ban Huawei from supplying 5G networking equipment to Canada’s carriers. On January 18th, 2019, Goodale told reporters during a cabinet retreat in Sherbrooke, Quebec that the government continues to look into the security implications and technical standards that relate to the deployment of 5G networks in Canada. “The process is obviously ongoing, we are examining the security issues as well as the technical issues with a great deal of care. 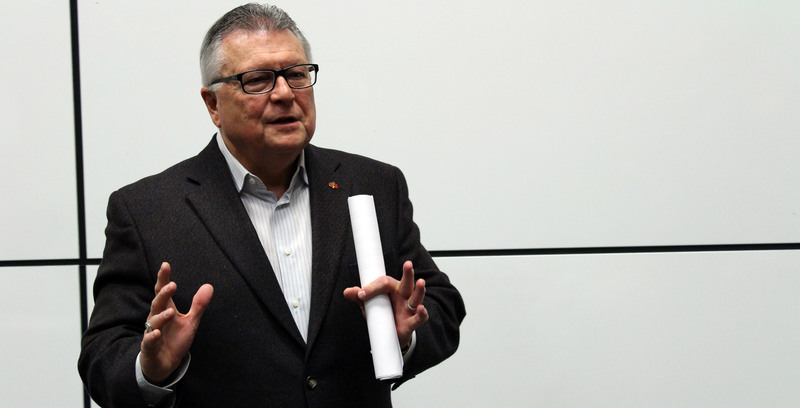 We’ve made it abundantly clear that we will not compromise national security,” Goodale told reporters. According to anonymously cited sources in a January 18th, 2019 article by Bloomberg, Canada’s security agencies continue to investigate potential security vulnerabilities related to Huawei’s equipment. The sources were not allowed to go in-depth with details on the review but said that Prime Minister Justin Trudeau was “months away from a decision” on whether to ban Huawei. “We understand the urgency of the situation, but as we go through the decision-making process, and making sure we have all the information necessary to take those decisions properly, we will not compromise,” Goodale said. On January 17th, 2019, China’s ambassador to Canada Lu Shaye warned Ottawa against banning Huawei from providing 5G telecommunications equipment, saying the country could face further repercussions. Lu, speaking at a news conference to journalists on January 17th, 2019, did not elaborate on what further repercussions Canada could face as a result of the bilateral spat. “I believe there will be repercussions,” Lu said, referring to if Huawei would be banned. He spoke through interpreters on Thursday afternoon and urged Ottawa to make a “wise” decision. Canada’s relationship with China has been sour since the beginning of December when Canadian authorities arrested Huawei’s global chief financial officer Meng Wanzhou in Vancouver. Meng, who is also the daughter of Huawei’s president and founder Ren Zhengfei, was arrested on fraud-related charges. She was granted bail but faces extradition to the U.S.
Canada has had a relationship with the telecommunications giant since 2008. Over the years, the company has built research partnerships with several universities and is working with Bell and Telus on 5G infrastructure development. But because of fear of cybersecurity attacks, the U.S. banned the company from providing 5G equipment in August 2018. Following the U.S., Australia and New Zealand, have also banned the company. The three countries are members of the Five Eyes intelligence-sharing alliance. The alliance is made up of a group of countries that share information and intelligence with regards to terrorism, security and espionage. The group consists of the United States, United Kingdom, Canada, Australia and New Zealand. “Other countries have obviously made their views known and their views are important to us. We will weigh all of that very carefully in the decision,” Goodale said, when asked about these countries that have banned Huawei. The Toronto Star reported that he downplayed any warnings of economic punishment.